Did anyone visit the Popular Bookstore warehouse stock clearance at The Starling? That happened last month and since I practically go to The Starling everyday, of course I dropped by. There were piles and piles of books everywhere (I love books!) and you can probably guess which type of books that I gravitate to. In spite of me telling myself time and time again "NO MORE COOKBOOKS!!! ", I still found myself scouring for cookbooks at the 3-for-RM20 section. Yeah, me and a few other enthusiastic aunties were digging and digging here and there, looking for books that would soon find their place on a bookshelf pregnant with other dust coated cookbooks (I am speaking for myself). The trouble with this type of special offer is that once you found a book, you would have to find another two. Much time was spent looking for the other two books, making sure that they were what I really wanted and not merely to make up the numbers. And it happened again some two days later for the second time within the same week. This is some sort of serious addiction! You must be wondering where I am going with all this. Well, one of the books I bought is Simple Asian One-Pot Meals and I one-potted a meal by modifying the Cranberry-Hoisin Chicken "n" Rice into this Cranberry BBQ Sauce Duck and Rice. I didn't have any Hoisin sauce at home so I substituted with Oriental BBQ Sauce which had been sitting in my fridge for a very long time. I also had about a cup of dried cranberries leftover from Chinese New Year baking that I could use for this recipe. I have never used cranberries in savory meals let alone in a rice dish, so this was a revelation. The cranberries added a special something to the rice just like how raisins are so wonderful in rice dishes like Nasi Minyak. After having spent RM60 for 9 cookbooks, as penance, I promise to cook at least one or two recipes from the newly acquired books every week. How's that? 1. Heat oil and saute garlic until aromatic. 3. Add rice and seasoning, stir to evenly coat the rice with seasoning. 4. Add roasted duck meat and cranberries. Stir to mix. 5. Transfer to rice cooker, add water and switch on the rice cooker to cook the rice like usual. my friend went to the book fair. Your duck cranberry rice looks delicious and I would love to have a bowl. yums! yums! good idea to cook a few recipes each week from the 9 books. looking forward to reading your posts. LOL! I did not take photos at the book fair because there were so many people. 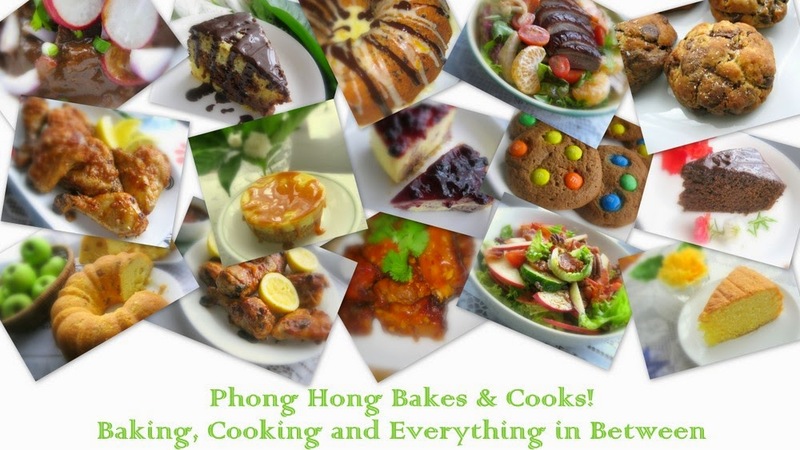 those cookbooks did not go to waste as you tried the recipe and even modified it...ok la...I like looking at those pictures in the cookbook, but I wouldn't buy them...coz I dun cook, LOL! Must make sure I did not waste money. Must try out the recipes! It was surprisingly good especially the cranberries. I also went to the book fair and strained my neck trying to look for you at the cookery boos section. So many aunties jostled there and which one was Ah Hong Chee??? I tried to look for small feet big sized aunty but none. I stared at the aunties from head to toe and some thought I was a pervert with eyes like a hungry wolf!!! Actually I tried to find a "Dame Edna" looking aunty that could resemble the hilarious you. Now you are so pandai to masak nasi using dried cranberries! I could imagine the better taste than using raisins as I often used these dried cranberries & raisins for my overnight oats and they tasted heavenly superb when bloated. My wife has similar habits like you, buy so many tons of cook books but they collect dusts on the shelves! Maybe she did cook 2-3 dishes per book like you. Haiks! hah..hah... I love Dame Edna but no lah, I don't look like her LOL! Ah, so there are other people like me, using cookbooks to collect dust! Your promise to cook one or 2 recipes from the books you bought sounds good to us. Dried cranberries in your one pot meal sounds interesting and your bowl of rice looks delicious. I hope to share more recipes but as it is, I work Saturdays and time is quite limited on Sundays! I am glad I tried this recipe because it turned out quite well. I wonder what that tastes like especially when I would associate cranberry with cookies. My missus has a whole lot of cookbooks, solely for decorations. LOL!!! Ah, your Mrs too! LOL! Used to browse and check out recipe books in Popular Bookstore when I worked in a shopping mall. My favourite hang out place after lunch. Lol. Now I don't buy, I just Google and if I find a recipe interesting, I will either print or write in my journal. Actually, no point buying because I find that I like only maybe 2-3 recipes. So wasted. Nice pics. This website (https://openlibrary.org/) has many western ecookbooks to borrow & it is free. I wish I could read Chinese, so I lost out on so many books :( Yup, no more crispy skin.